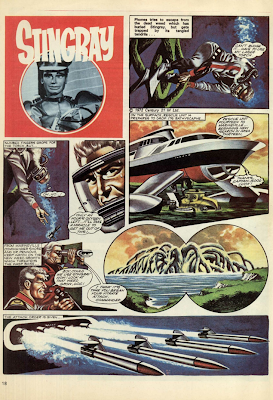 This Week In: 1969, 1971 and 1972! 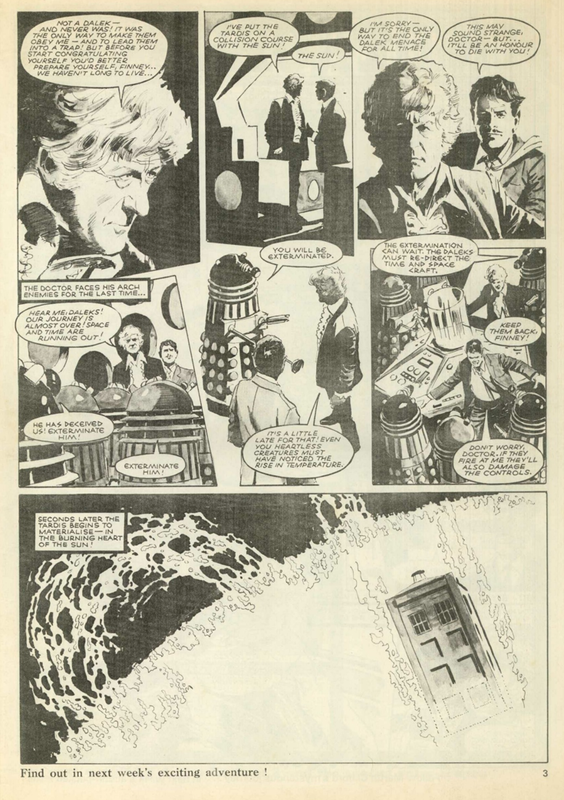 I've a rather special post today because I head back to three different years, (I was hoping to do four, but I don't have a comic from this week in 1970), and take a look at not one, not two, but FOUR different comics! I'll dive straight into it, and the first comic I'll be taking a look at is Joe 90 issue #11, dated 29th March 1969! 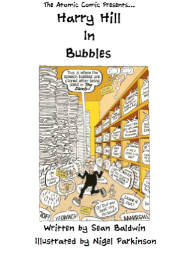 This comic was a bit pricier than other comics, costing you 8D to purchase. Of course, the star of Joe 90 is Joe 90, and, as advertised on the cover, this week's adventure takes him to the Himalayas in an exciting three-page adventure! 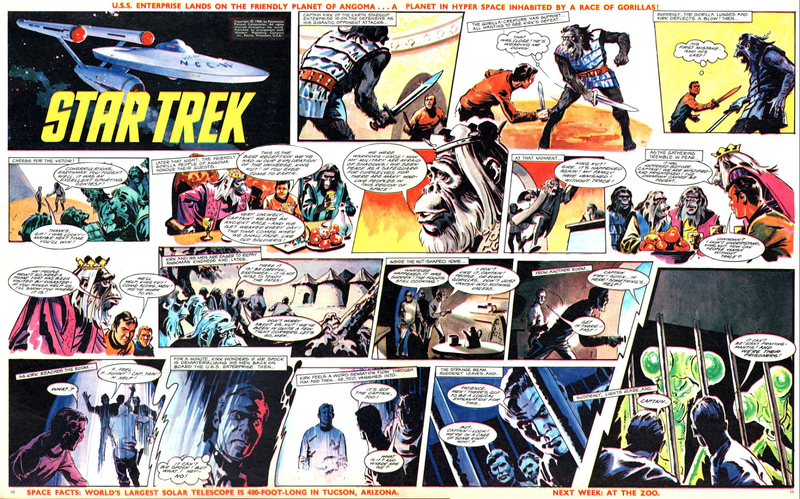 The highlight of the comic for me is the Star Trek strip, which appeared on the centre spread in full colour! 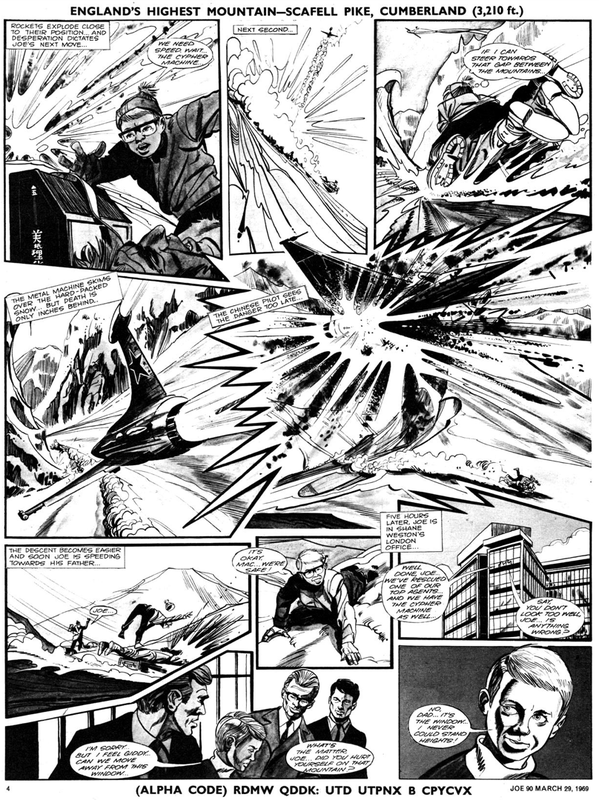 Since I last reviewed Joe 90 comic (here), I've seen a few Star Trek films and episodes, and it's not too bad! 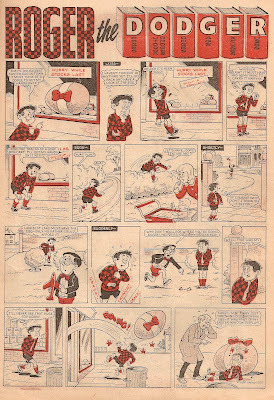 I believe Harry Lindfield was the artist for this strip. 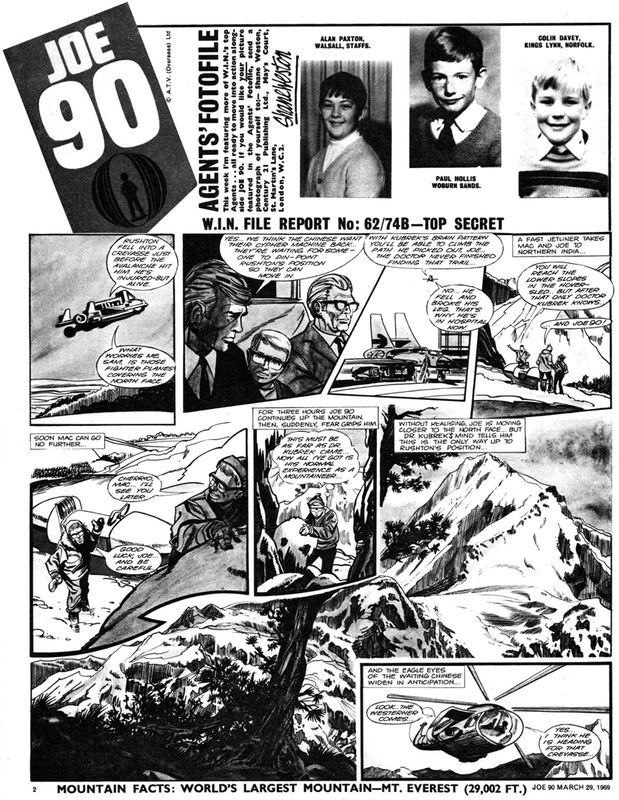 And finally, here's an interesting advert from inside the comic for Joe 90 Kellog's Sugar Smacks. 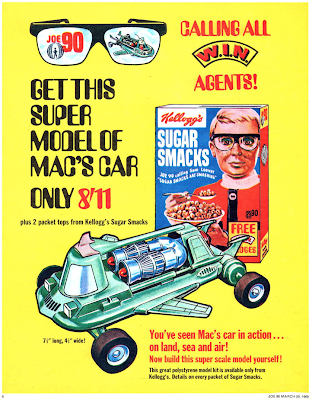 If you collected two packet tops plus sent along 8/11 you could get yourself a "Super model of Mac's car"! Whether or not this caught on I don't know, but many readers would already have a model of Mac's car as it was given away with the first issue, although it wouldn't surprise me if many of them had since been lost or destroyed. 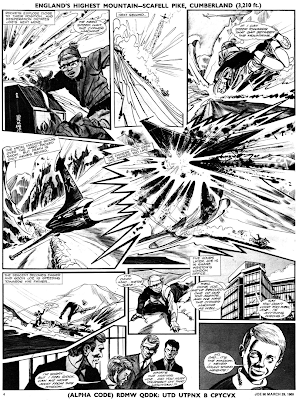 If you are a fan of Joe 90, I believe it is possible (as with most programs) to buy all the episodes on Video or DVD. 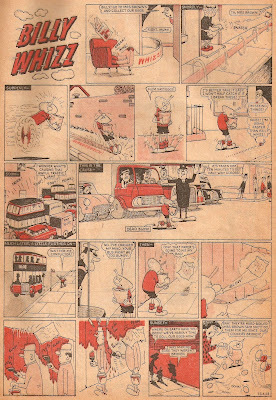 I found this old video amongst a load of others nobody watches anymore! 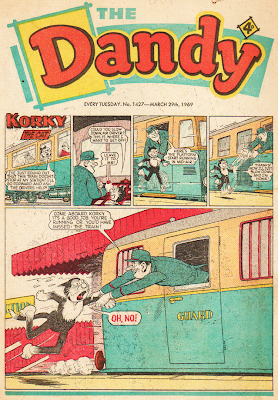 Moving on, and the next comic I'm going to cover is The Dandy, and this issue, numbered #1427, went on sale on the 29th March 1969. 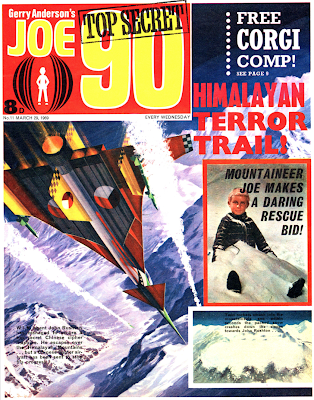 This issue would set you back you just 4D, half the cost of Joe 90. 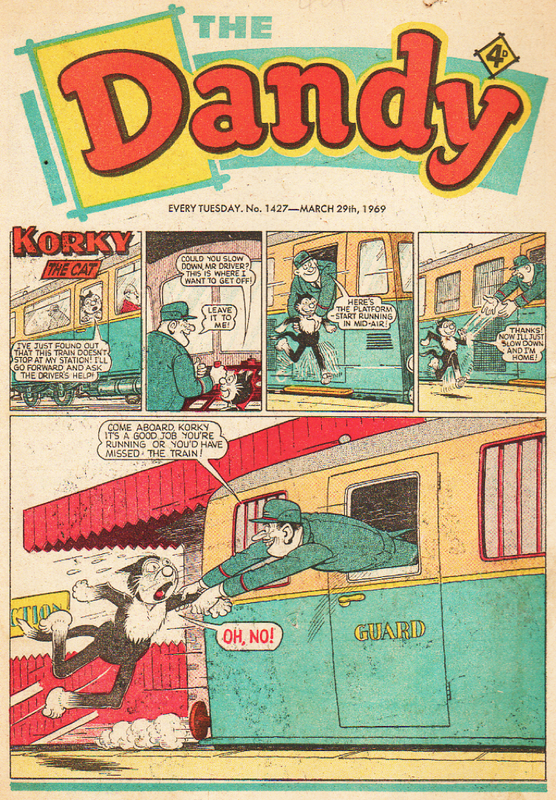 Moving inside and the first strip we see is Desperate Dan, this is one of the very last episodes Dudley Watkins ever drew, as he died in the August of that year. 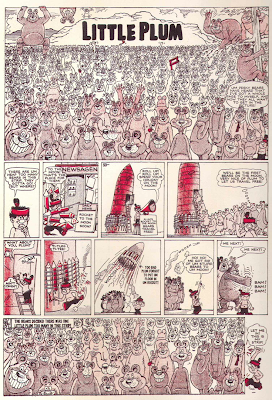 An interesting strip is The Purple Cloud, which is about the World's master crook - The Purple Mask! 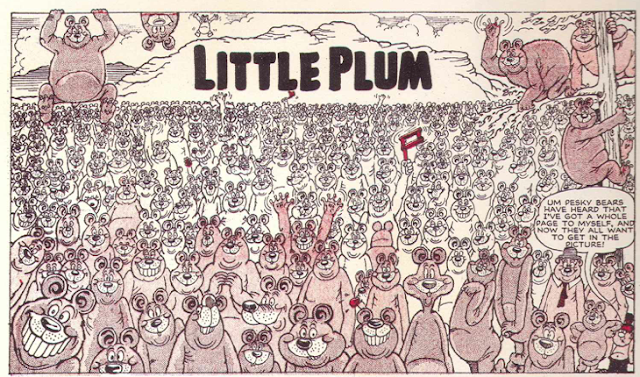 The purple cloud is some kind of chemical gas that can eat its way through anything to help the Purple Mask to escape! 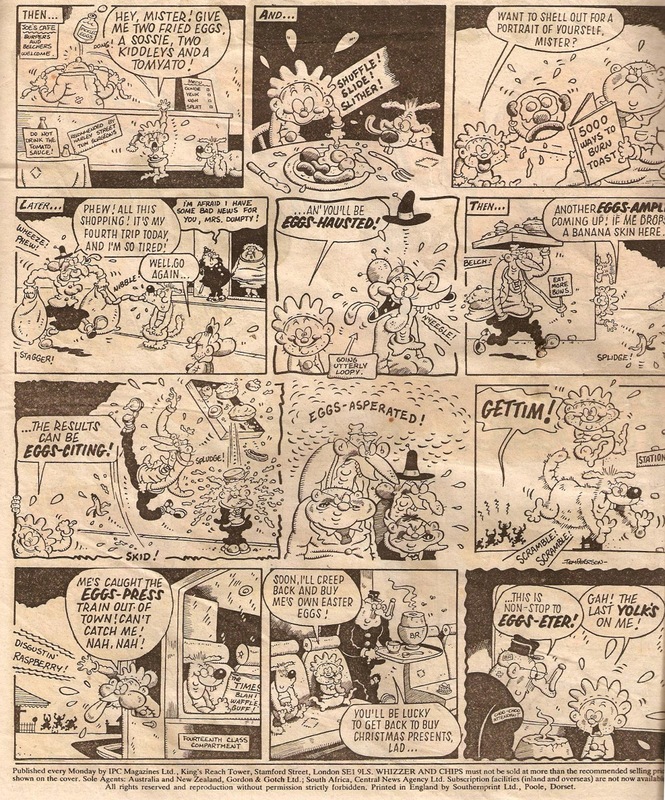 I think I remember reading that the strip was illustrated by Charlie Grigg (of Korky the Cat fame), but can anybody confirm this? Bodger the Bookworm is an interesting strip, and is very similar to the better known Bookworm who started in Whoopee. 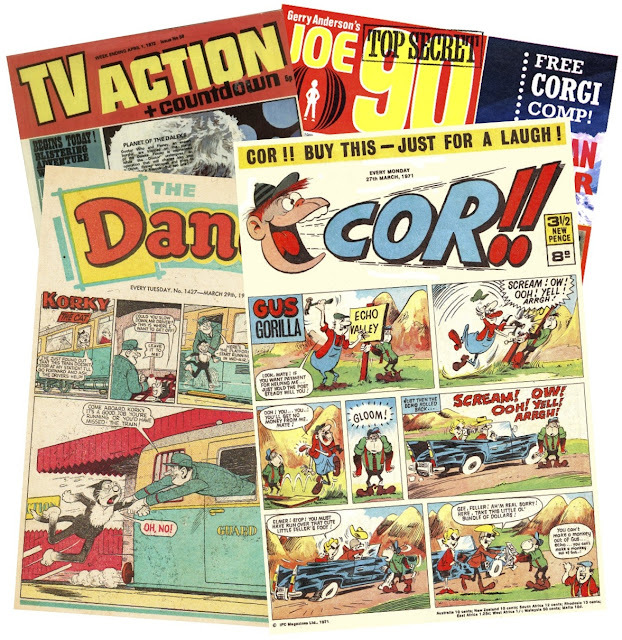 The third comic I've got lined up is the Cor comic that went on sale this week in 1971, or 27th March 1971 to be exact! 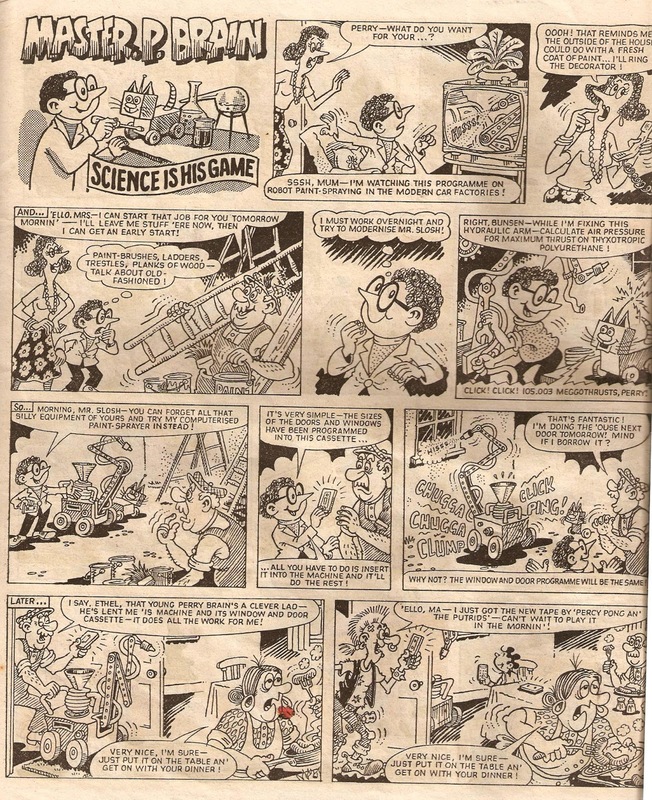 Decimalisation was just coming in around the time this comic went on sale, and you could buy the comic for 8D or 3 1/2 new pence! 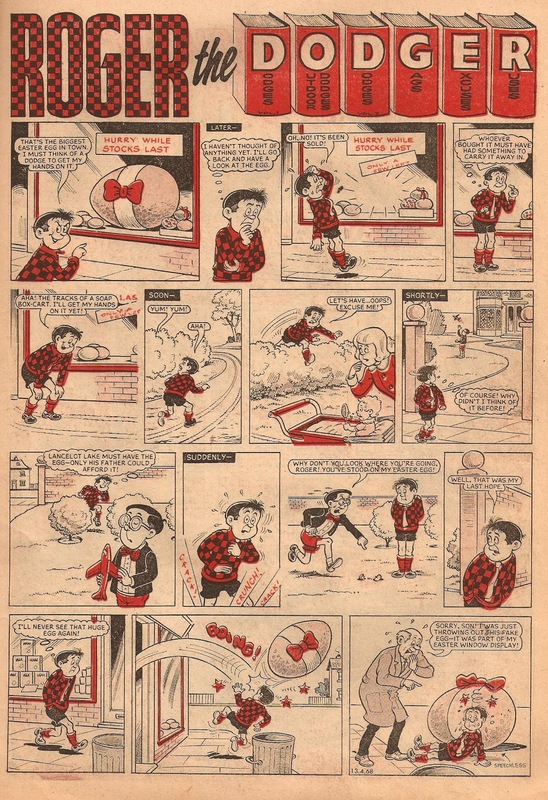 Football themed strips are always good, and Cor had Football Madd, which was about a young boy named Micky Madd who was, well, football mad! 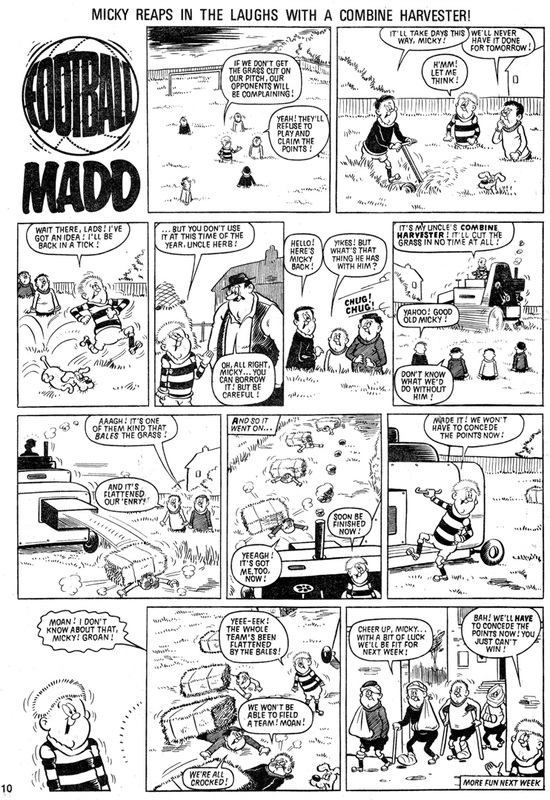 I'm not sure who the artist was for this strip was, my first guess would be Mike Brown, by Irmantas over at Kazoop suggested Peter Davidson. 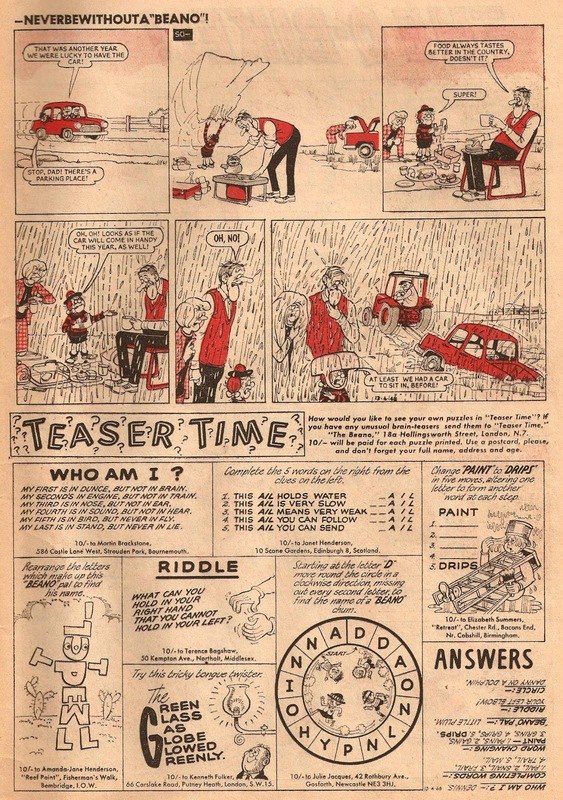 Does anybody know for sure? 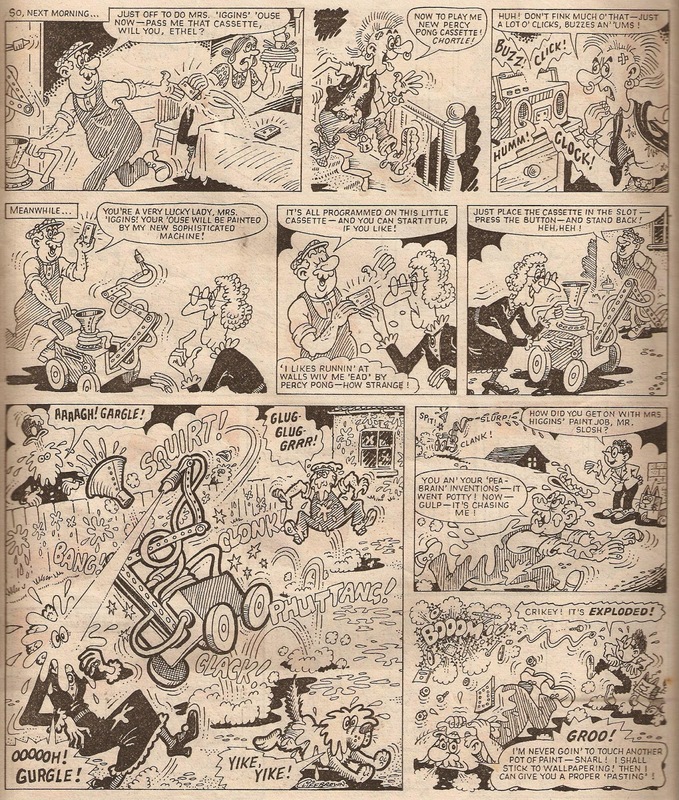 I'll also show Whacky, not only because the artwork is brilliant (the artist is Mike Lacey), but also because he shares the same name as this blog! 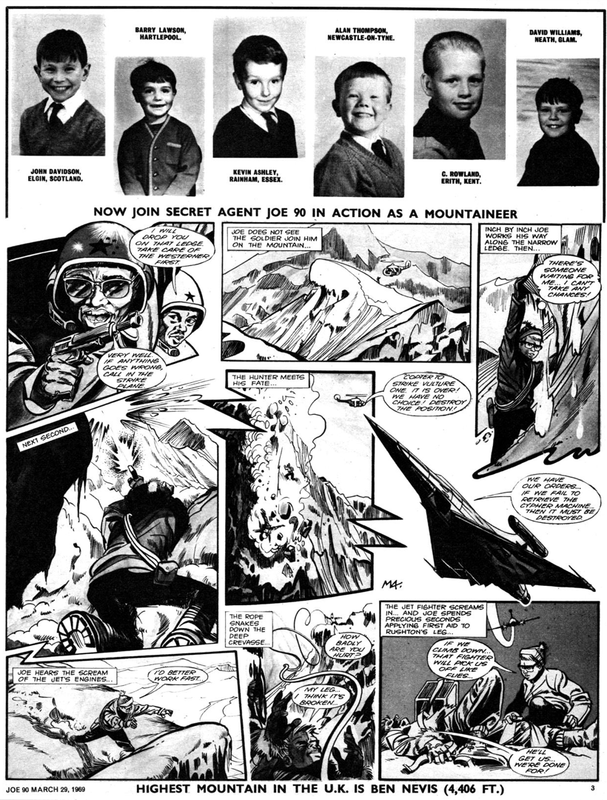 And interestingly, Jack Pott didn't start in the comic Jackpot, but instead his origins can be traced back to Cor! Joe McCaffrey illustrated his adventures. 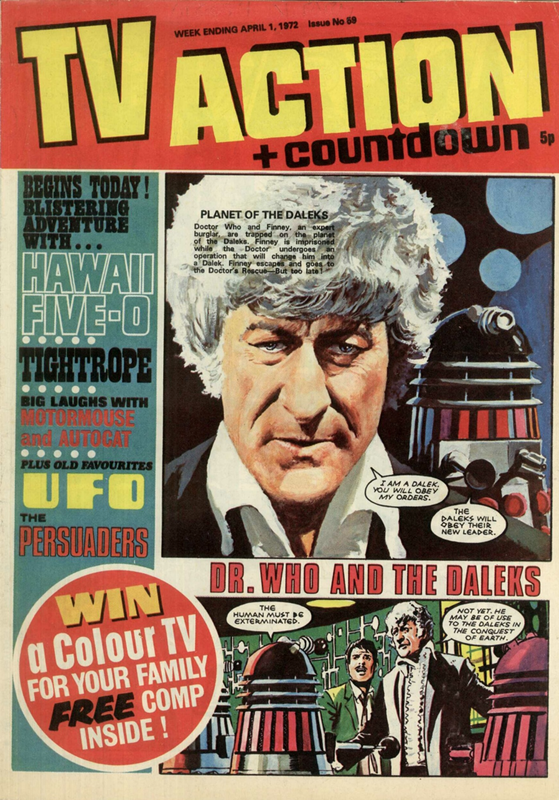 Moving on now to our final comic - TV Action. 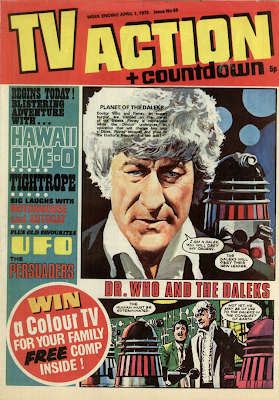 This issue is dated Week Ending 1st April 1972, and cost 5p. 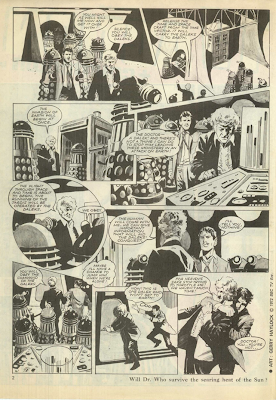 Dr. Who and the Daleks were the stars of the cover, and the strip continued inside, illustrated by Gerry Haylock. It ends on a very exciting cliff-hanger, with the T.A.R.D.I.S plunging straight into the heart of the sun! 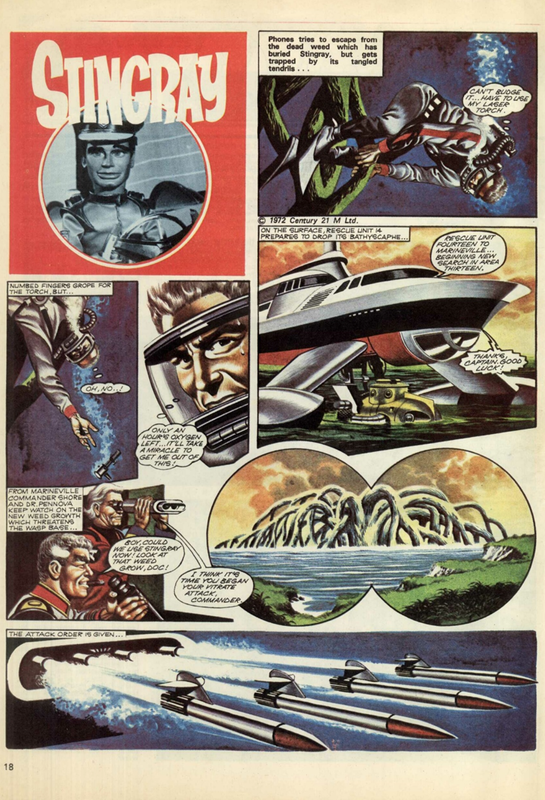 Stingray was a very well illustrated and coloured strip, although I'm not sure who the artist was. 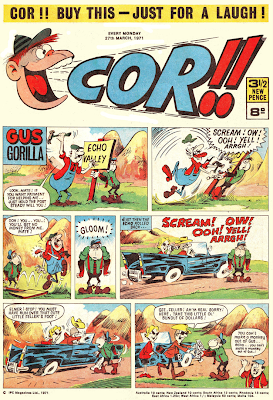 That sums up a look at these four different comics. 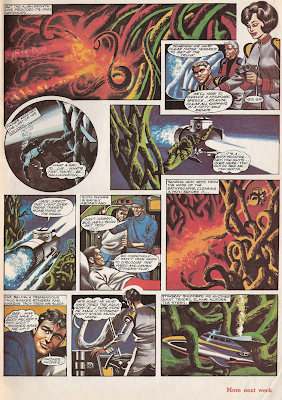 Whilst I was writing it up an idea occurred to me - why don't I write a blog post like this, but of the same comic over a period of four or five years. This would show how tastes changed and how the comic evolved to show that. 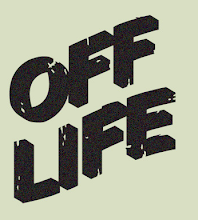 It's just an idea for now, but stay tuned! 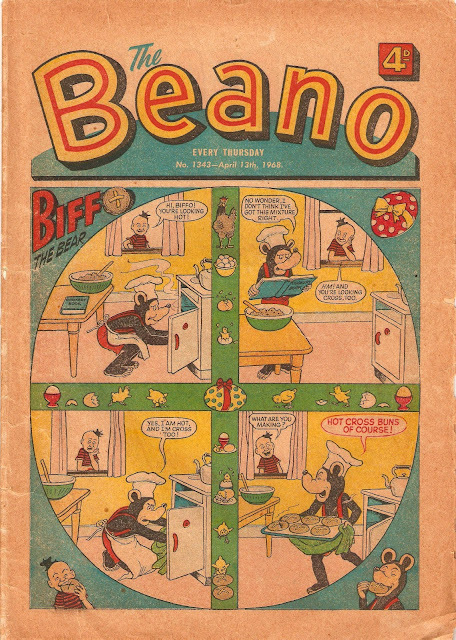 It's time to look at another Easter comic, and this time we head back to the 1960's, or April 13th 1968 to be exact, and take a look a Beano issue #1343. 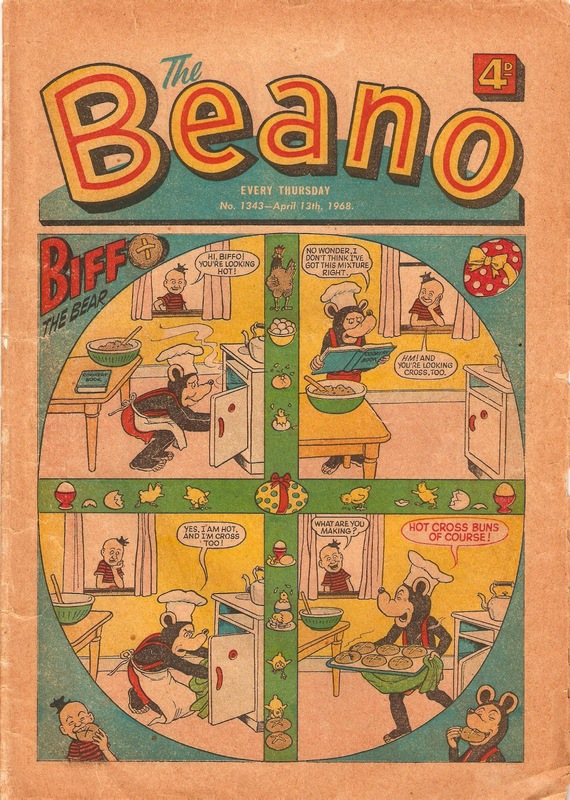 Every year the Beano celebrated Easter (well, in the 60's anyway), Biffo the Bear's strip would always be in the shape of an Easter egg, and this one also has a hot cross bun in the place of the 'O' in Biffo. 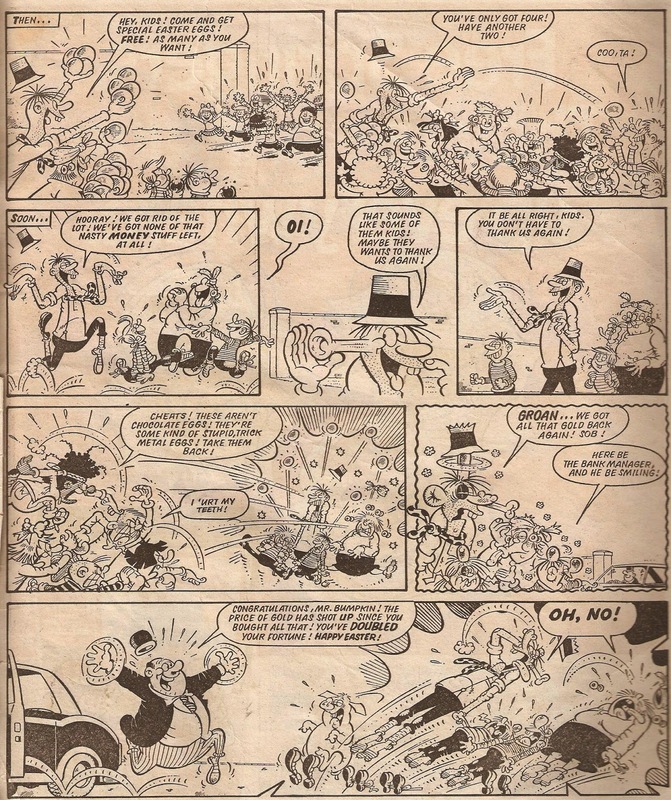 As always, Biffo and Buster are illustrated by Dudley Watkins! 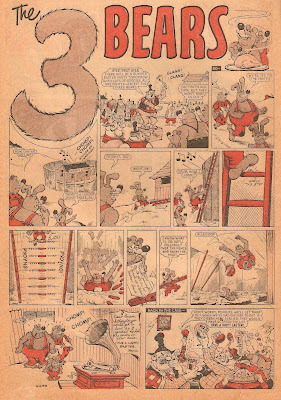 Let's move inside, and The 3 Bears want to join in with Hank's super Easter party! 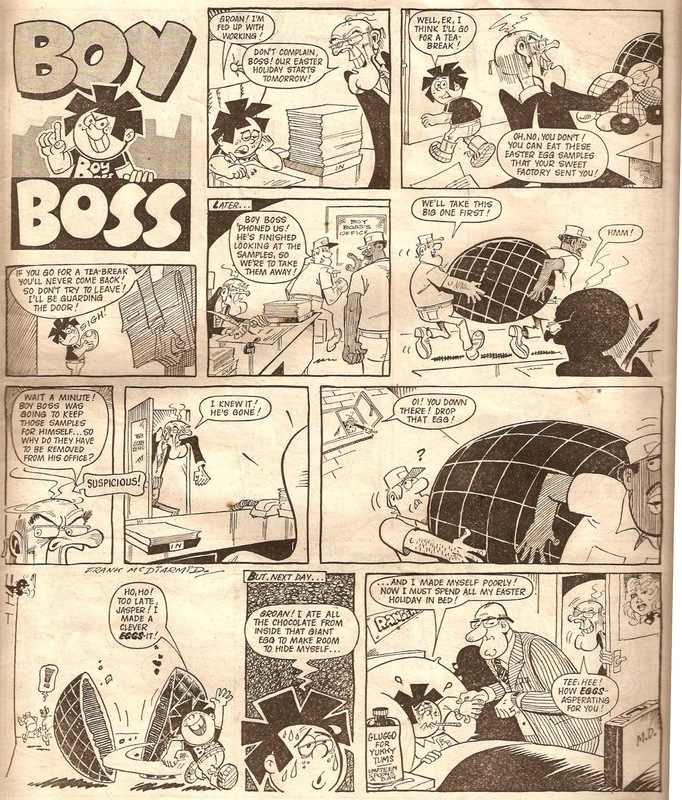 Unfortunately for them Hank has thought ahead and has taken extra precaution to ensure they don't steal all the food! 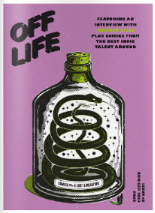 Bob McGrath did an excellent job with the artwork! 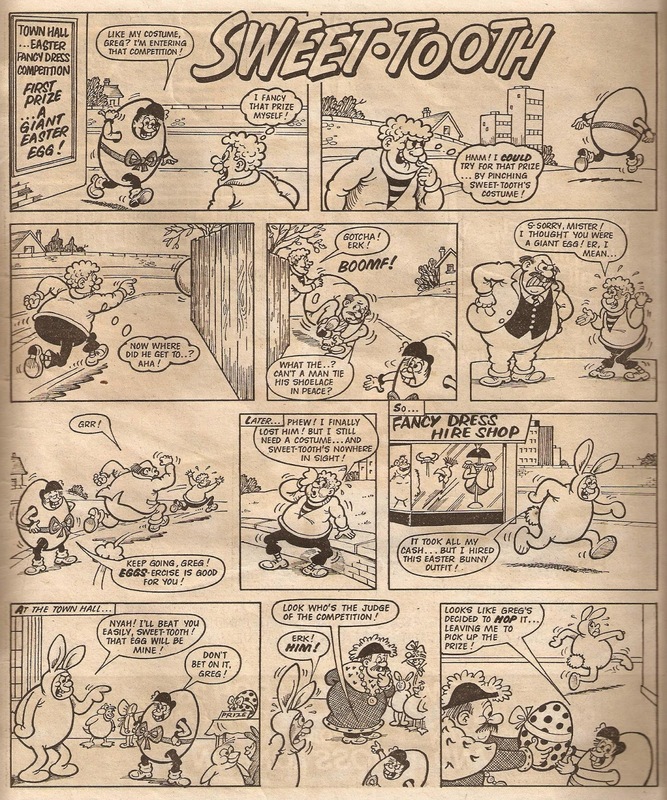 Roger the Dodger appeared next, who naturally wants the biggest Easter egg in town, without paying to get it! 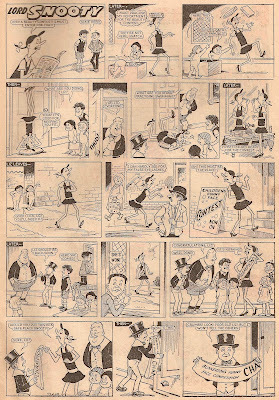 This strip, particulary the shop keeper in the last panel, was heavily influenced by Ken Reid, who of course drew the strip to begin with, but is actually illustrated by Robert Nixon, who took over when Ken left in 1964. 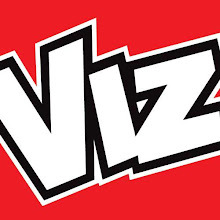 Billy Whizz next, and prepare yourself for something amazing! This strip shows a very rare sight indeed - Billy Whizz willingly moving slowly! 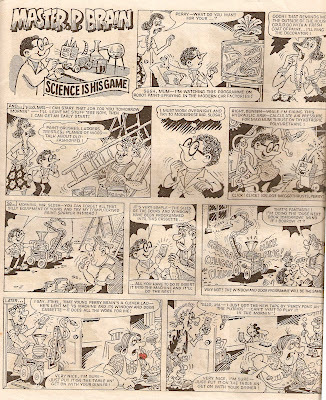 This rare scene was captured with paper and ink by Malcolm Judge. 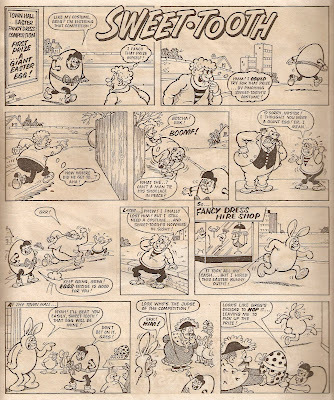 David Sutherland's Bash Street Kids came next and, although it begins with an Easter egg for Smiffy, is more focused around bubblegum than anything else! 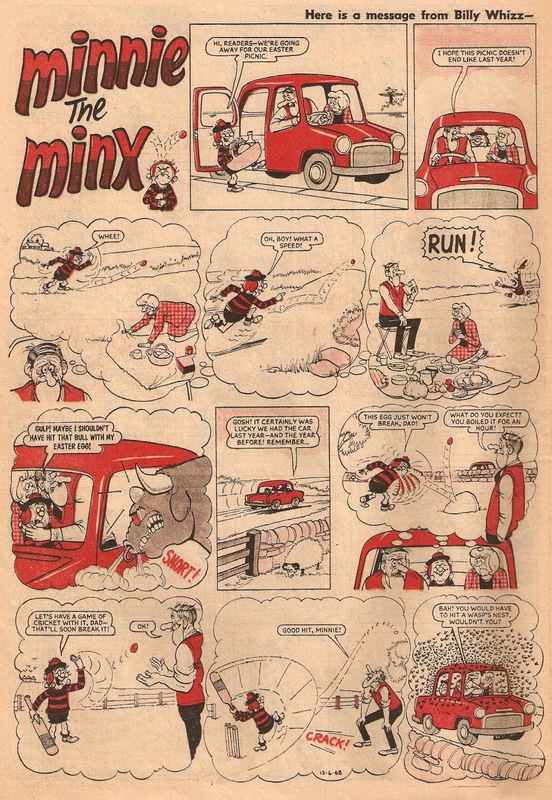 This is a fantastic episode, I love all the over exaggerated scenes all caused by a small piece of gum! 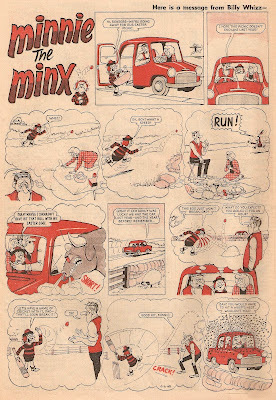 Minnie the Minx is always fun, and this one shows all the things that have gone wrong in the past - it really is a surprise they're going this year at all! 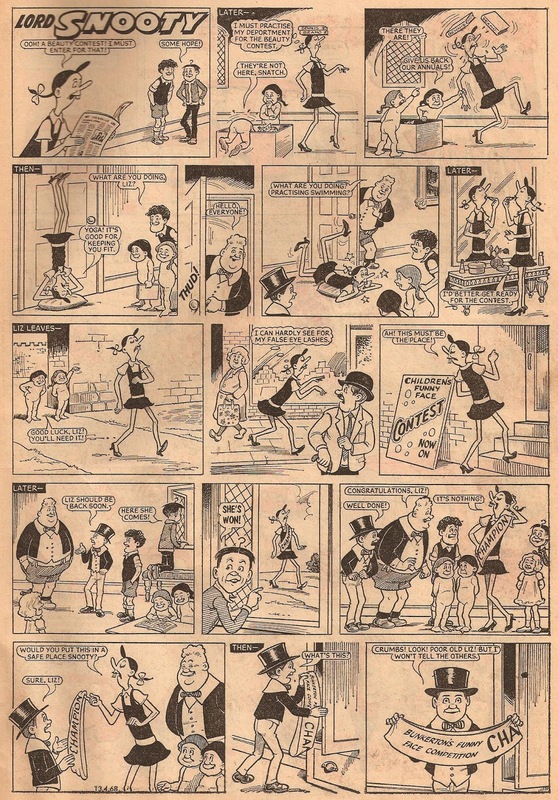 The artist is of course Jim Petrie, and I've also shown the 'Teaser Time' section for you to do if you've got some spare time. 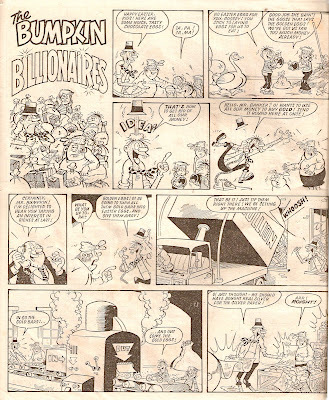 And finally, I'd like to show this Lord Snooty strip, not because it's Easter related, but because, simply put, it's funny! 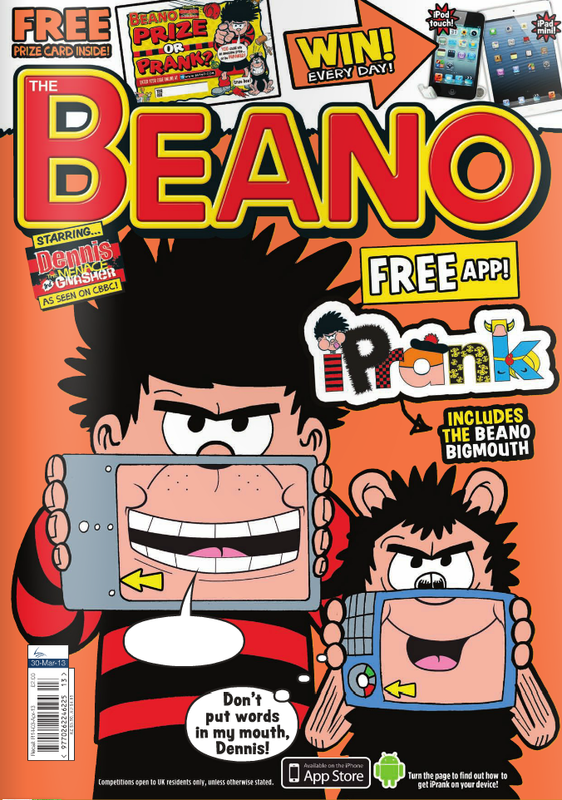 And don't forget to buy this week's Beano as well, which does have one or two Easter-themed strips in it! Here's the cover, and it costs just £2! Easter is approaching fast, so it's about time I covered an Easter comic. 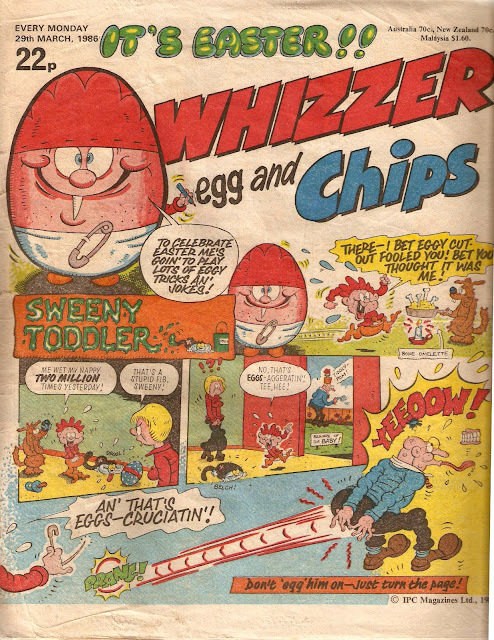 To do so, we head back to the 29th of March 1986, and take a look at this copy of Whizzer and Chips - that year's Easter Special! One of my favourite comic characters - Sweeny Toddler - was on the front cover, as he had been since just after Whoopee merged into Whizzer and Chips almost a year earlier. 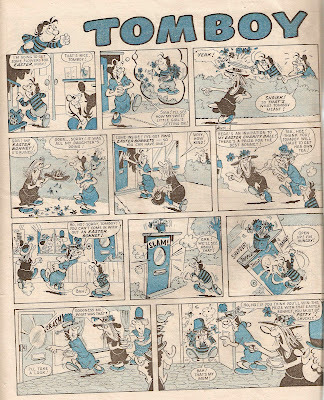 Sweeny was a very fun character and, although they are all good, this particular episode is one of Tom Paterson's better-drawn strips! Well, it is in my opinion at least, so take a look and judge for yourselves. 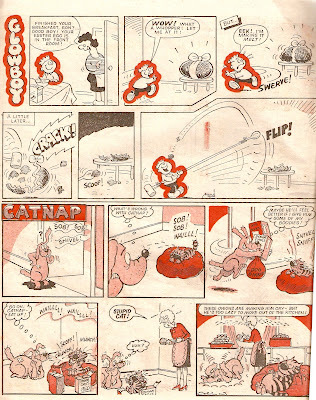 Since it's all about Easter, I'll only be showing the Easter related strips, and the next one is, of course, Sweet Tooth. 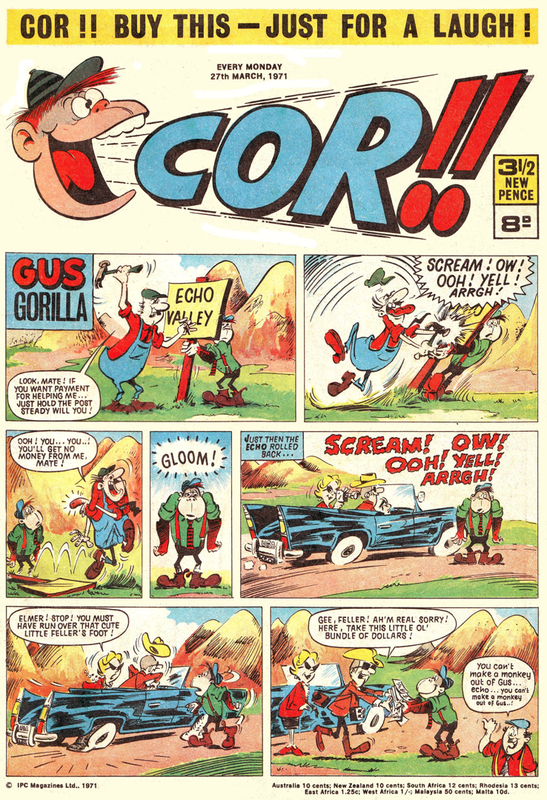 Usually illustrated by Trevor Metcalfe, this episode was illustrated by Doug Goodwin. 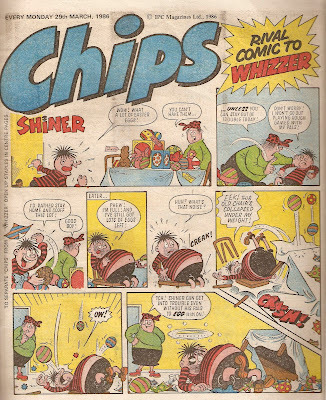 Unlike Sid and Slippy (the stars of Whizzer), Shiner's (the star of Chips) strip WAS Easter themed! As always, despite the fact he's staying out of trouble, Shiner still managed to live up to his name and get, well, a shiner! 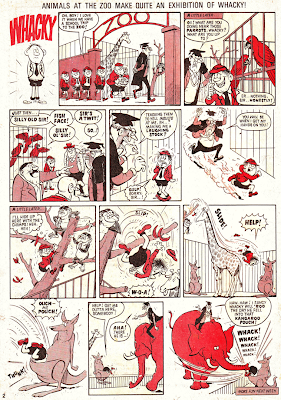 And so, continuing into Chips, the first Easter themed strip was Boy Butler, illustrated by Mike Lacey. 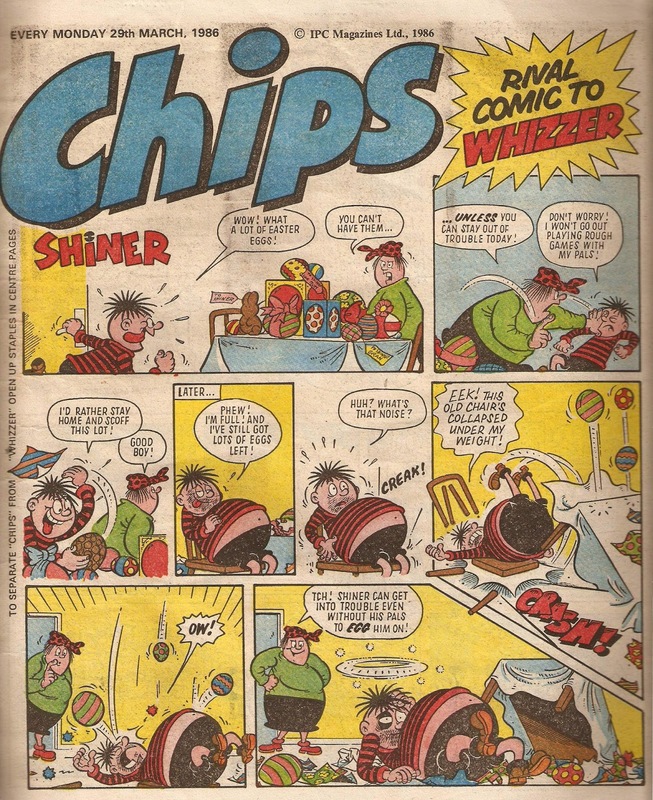 Tomboy originally appeared in Cor!, but strips were reprinted for Whizzer and Chips in the 1980's. 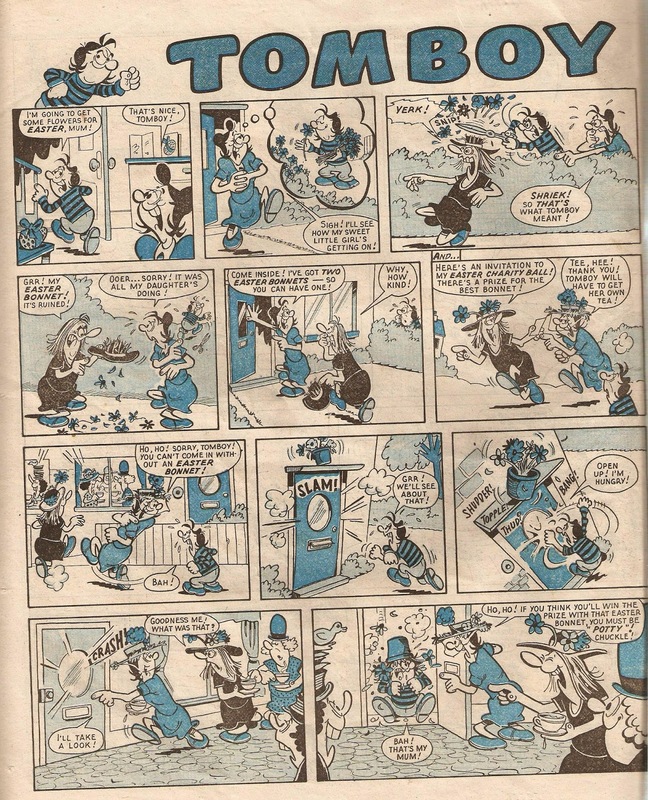 This strip was all about Easter bonnets, a very popular theme in British comics around Easter time - a lot of different and hilarious stories could be based around them! 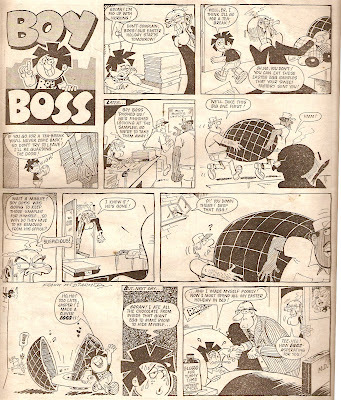 The final Easter strip in Chips was Boy Boss, the young boy who had a company left to him in a will. 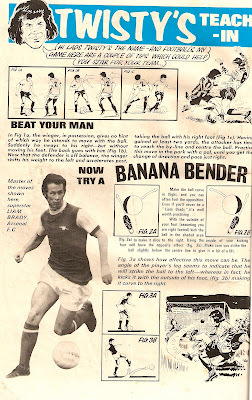 This one involves him sighing at the task of testing the Easter eggs - which I found very funny! 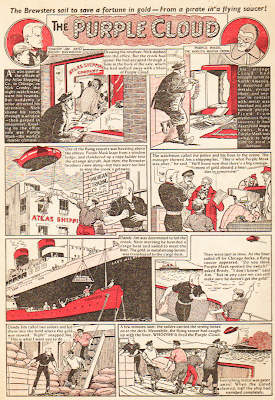 Frank McDiarmid illustrated this. 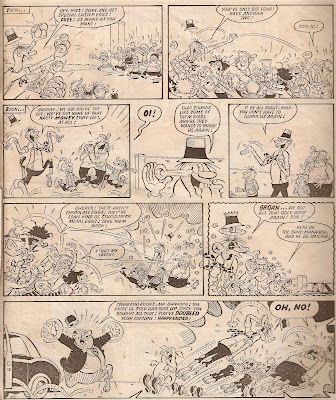 Back in Whizzer and, although not directly Easter related, I'm going to show Master. 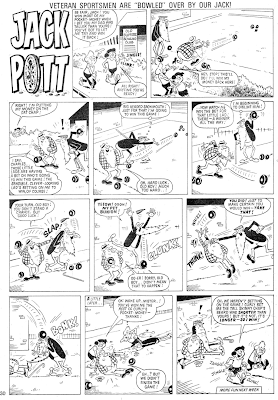 P. Brain because it is an interesting strip that a lot of people may not have heard of before. The usual artist is Cliff Brown, who you may know as the artist of Timothy Tester, but I'm not too sure if this one is by him. 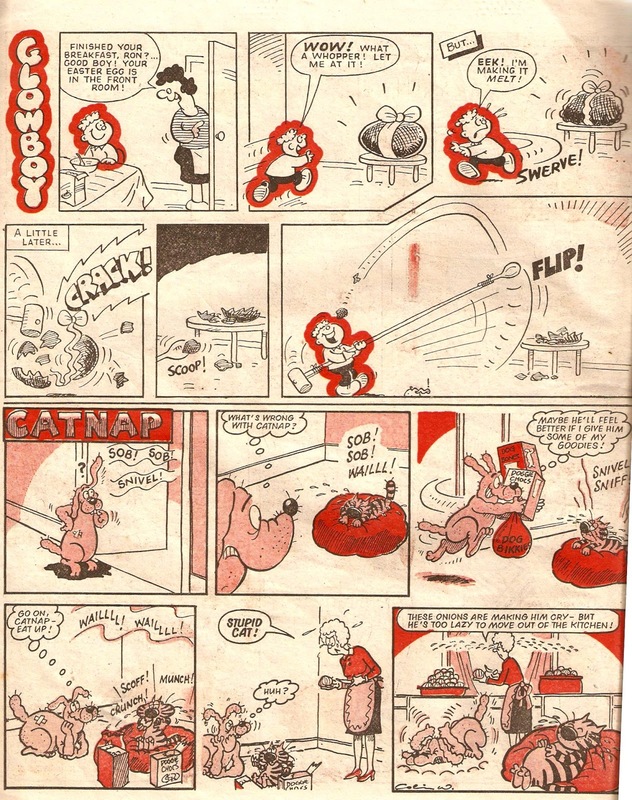 Glowboy shared a page with Catnap, and was based around the stories of a boy who glowed! 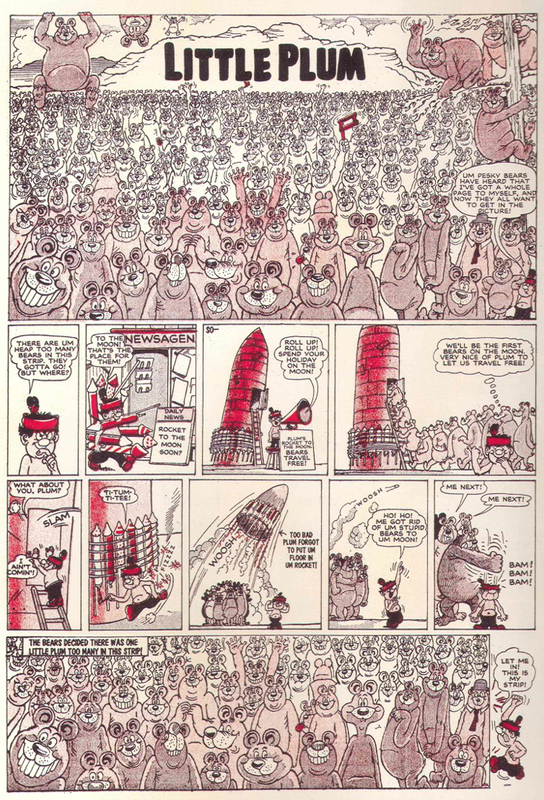 A very weird strip illustrated by Roy Mitchell, and Catnap was illustrated by Colin Whittock. 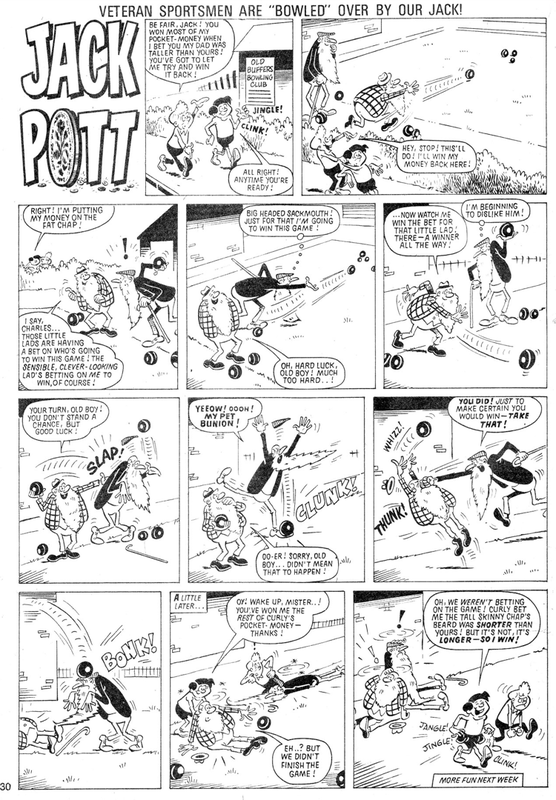 Terry Bave's Odd Ball was a very popular strip, and every time it was possible, Odd Ball would have a themed strip. 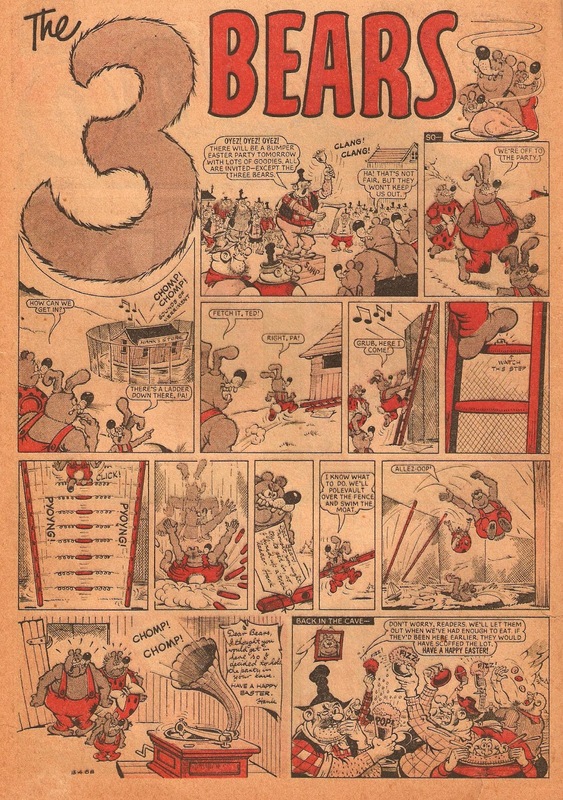 This one sees him turning into a giant red chick, as you'll soon see! 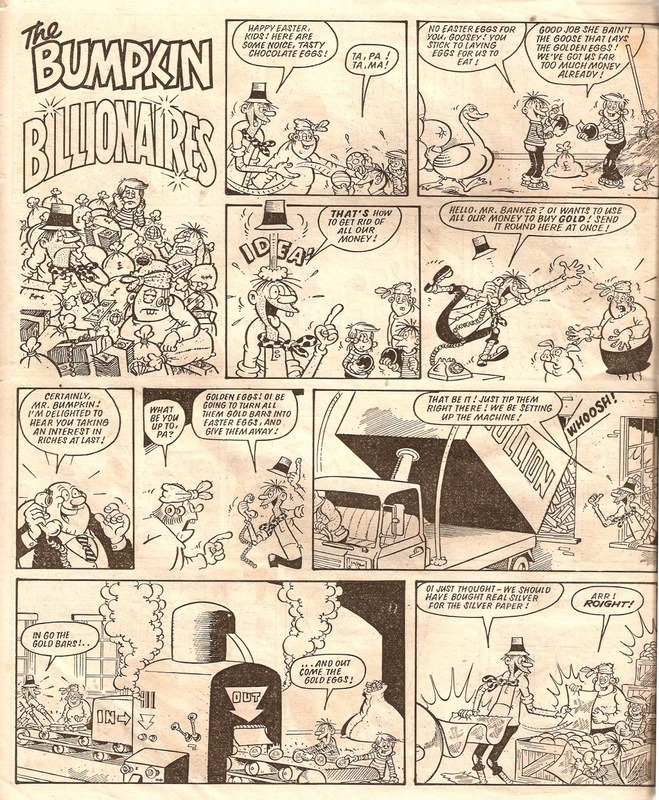 And finally, The Bumpkin Billionaires, illustrated by Mike Lacey. Forever trying to rid themselves of their fortune, this one involves them disposing of it in the form of solid gold Easter eggs! 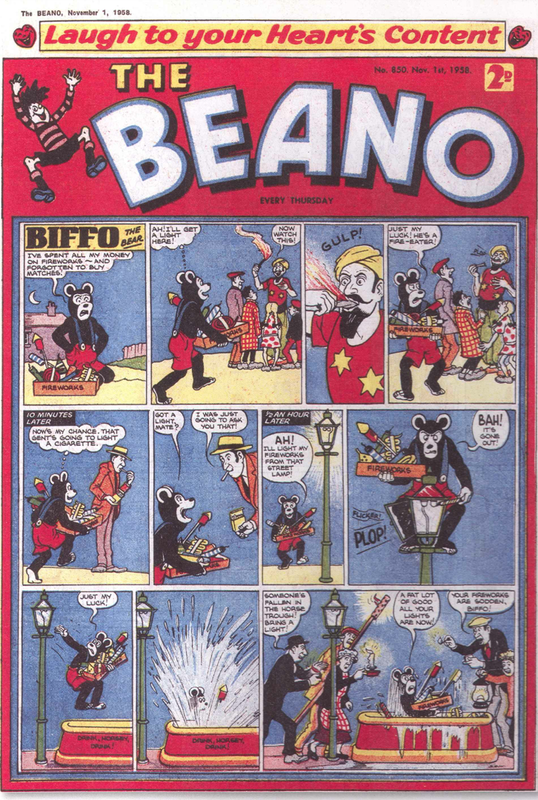 That brings us to an end of this fantastic comic, filled to the brim with fantastic artists and strips! 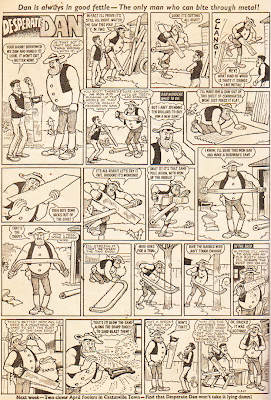 But, as a final bit of fun, can you spot the two raiders in the strips above? I guarantee they're both there somewhere! 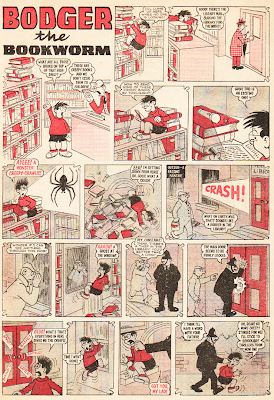 I went back to the same shop I bought The Best Of Topper from last week and came across another comic I hadn't heard of before - Red Dagger! 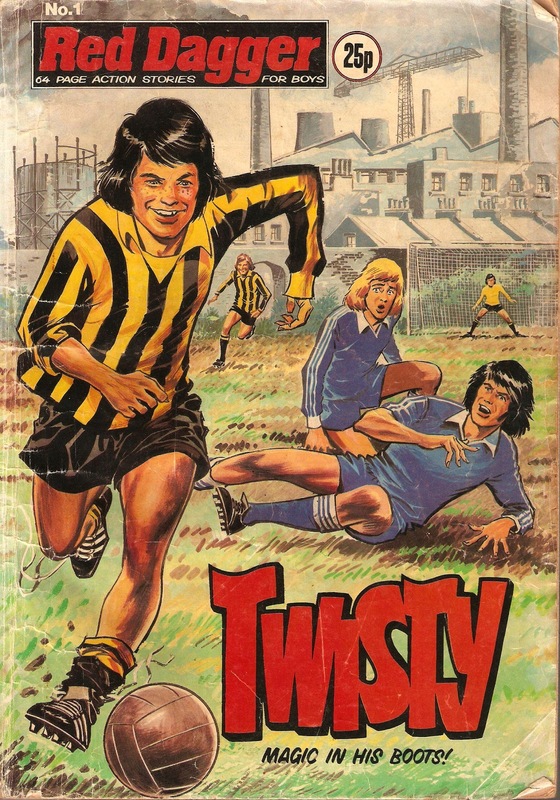 I picked up the first issue which was released in October 1979 by D.C Thomson and starred Twisty, with the sub-title 'Criminal-In-The-Making ... Or Soccer Star Of Tomorrow?'. On the first page of Twisty's story there is a small box reading "first published in 1976", meaning that it is the entire series collected and published in one 64 page book, and sometimes these stories were lengthened to fit into 64 pages. 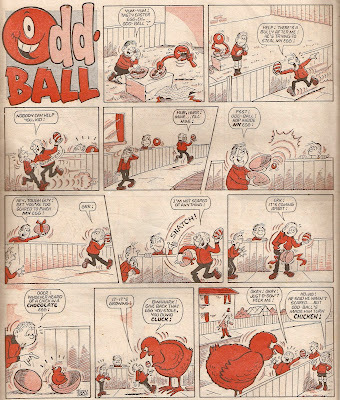 The first page was Twisty's Teach-In, where Twisty Lunnon shares some top tips for playing football! On the back cover is a slightly blurry full-page poster of Liam Brady, a football player for Arsenal until he left the following year. 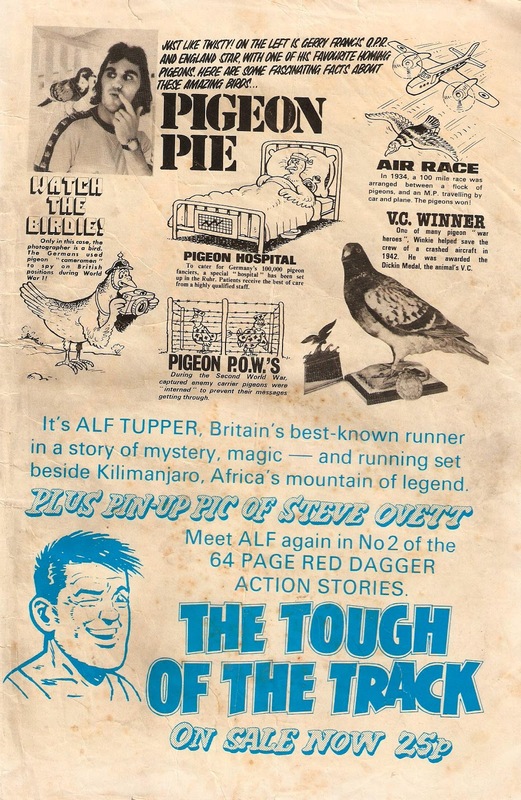 Inside the back cover is half a page of facts about pigeons (Twisty had two pet pigeons, so it isn't completely random), followed by an advert for the following issue, which would be starring Alf Tupper from The Tough Of The Track. 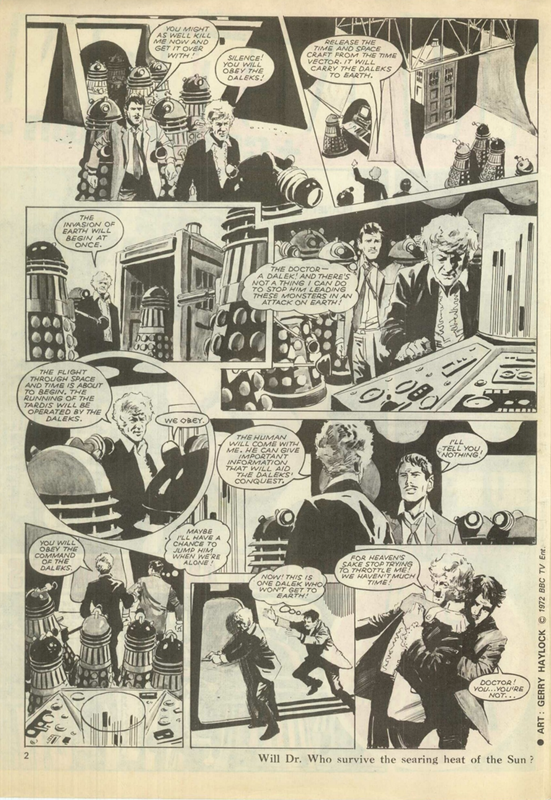 All the websites I've read to get information about Red Dagger have told me that the publication came out monthly and ended in June 1983 after 30 issues, but this advert says 'On Sale Now', suggesting that two were sold every month? I'm not sure. 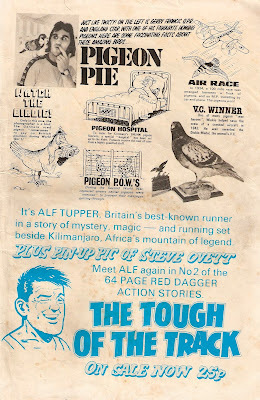 I wont be showing the full story here as 64 pages would make a very long blog post, but if you'd like to read it leave a comment and I'd be more than happy to post it in several parts. 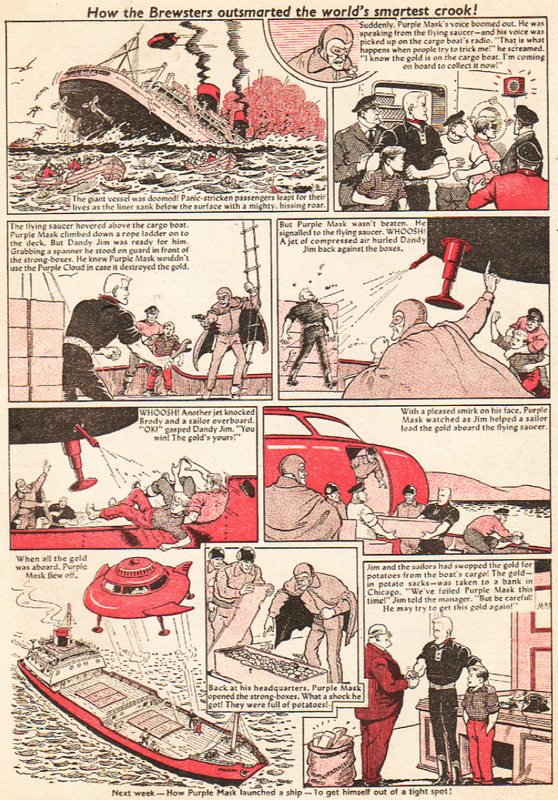 And if you're interested, there's a fantastic article about Red Dagger on Down The Tubes! 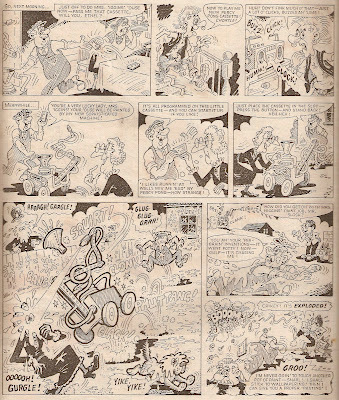 Whilst looking for a Jonah strip to scan for a post the other day I came across this very interesting and cool Little Plum strip in Beano #850, dated 1st November 1958. 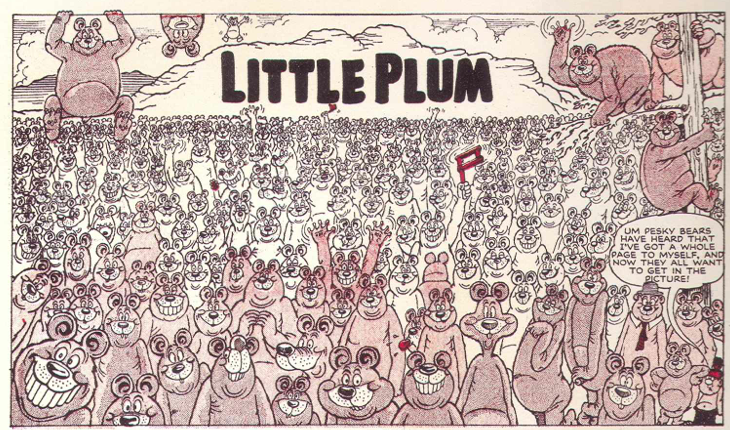 In this strip Plum decides there are too many bears in his strip, and tries to get rid of them! 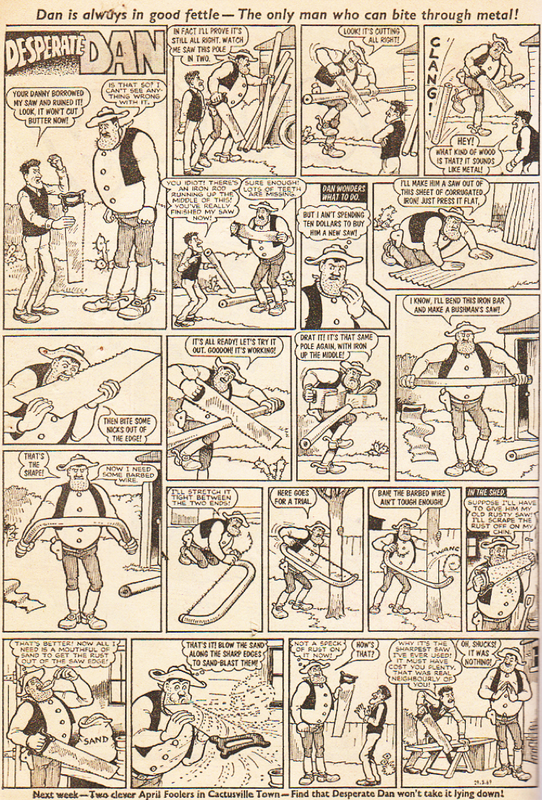 As well as interesting, this is also one of the funniest Little Plum strips I've ever read - I particularly love the eighth panel! As always, Leo Baxendale illustrated it. 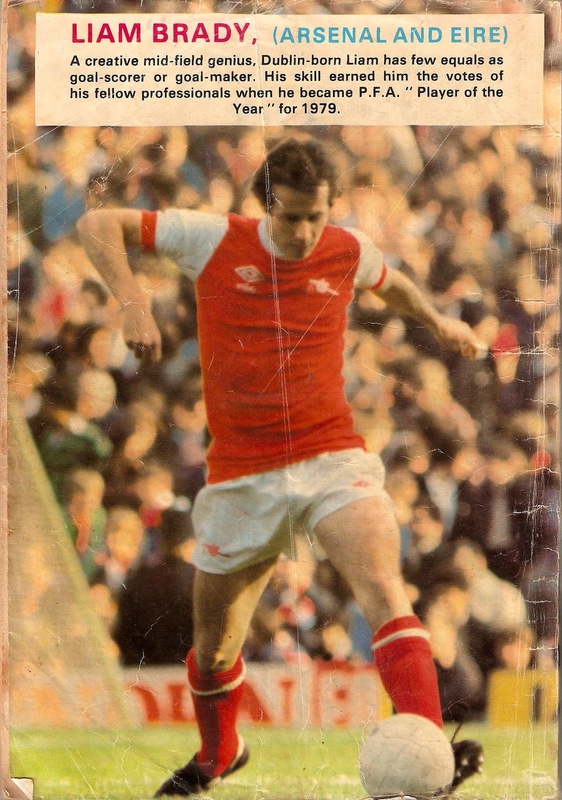 And if you're ever trying to track this issue down, here's the front cover. Captain Crucial Surfs To The Front Page! 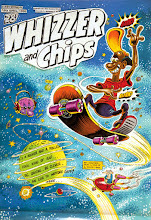 X-Ray Specs Sees The Cover! Chalky Draws Attention To The Cover! 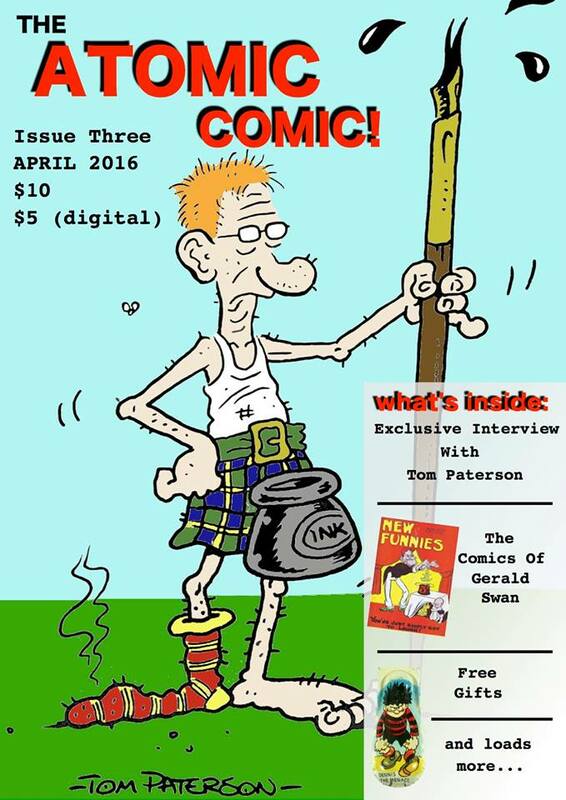 Lew Stringer Creates A Personal Blog!